Orthodontics is the area of dentistry concentrating on the alignment of teeth. Teeth that are crooked, crowded or protruding, and problems with your bite (how your teeth meet together) are covered by orthodontics, and are treated using such products as braces and aligners. Patients with poor jaw alignment can also be helped by orthodontic treatment. At Park Lane Dental, our orthodontist, Jayneet Patel, treats both adults and children with orthodontic concerns. Orthodontic treatment is only available to private patients, and is carried out one Saturday per month. If you are concerned about the position or alignment of your teeth, it can have a serious impact on your self-confidence, causing you to hide away your smile. In addition to cosmetic concerns, orthodontic problems may also impact on how you bite and chew food, potentially restricting your diet and affecting your general health. Badly aligned teeth are also more difficult to clean, which can lead to further dental problems such as decay and gum disease. Orthodontic treatment has advanced greatly since the old, metal wire and bracket train-track-style braces that many adults may remember their peers wearing at school. 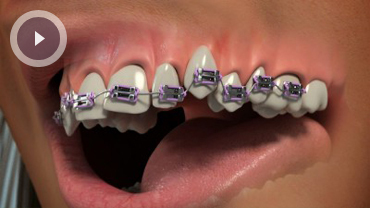 Metal braces are now much more comfortable and more discreet. For those who are concerned about wearing such braces, there are several discreet options available, including clear aligners and lingual braces. Lingual braces are similar in concept to standard braces, acting in much the same way. They still comprise brackets and wires that gently move your teeth into a new position. The crucial difference, however, is that lingual braces are attached to the back of the teeth, so that they will not be obvious when you smile. For more information about discreet orthodontic options, please visit our Invisible Braces page.